Any studies on minimum USD value needed on BTC to make mining worth the cost? My understanding of the Bitcoin ecosystem is that the task referred to as "mining" is actually the processing (confirming) of the Bitcoin transactions, and that the miner "finds" a coin when they find the accepted hash of a block of transactions. Based on the information in other questions here, the mathematical difficulty of processing the transactions is expected to increase as more Bitcoins enter the ecosystem while at the same time the block reward is expected to halve at every 210,000 blocks. The mathematical difficulty present in the mining process has of course a bearing on the cost of electricity and processing time of the hardware. 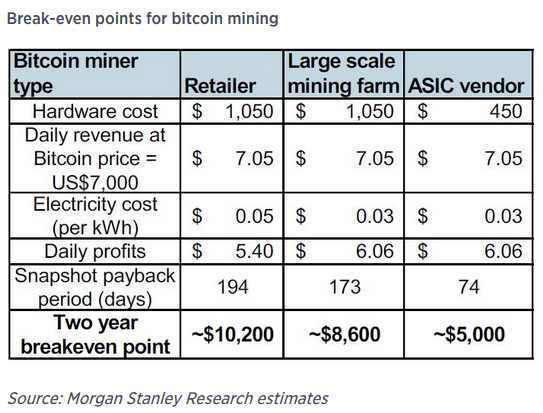 On top of that the miners do have costs for paying for the warehouse or other location where the server farms are kept, besides indirect costs in things like depreciation of the hardware. Currently we also have the situation that the USD value of BTC has been going down. With this in mind I wanted to ask if there are any studies about the minimum USD value that Bitcoin should have in order to make mining profitable? I don't think a study is necessary - logic should suffice. The difficulty of the hashing "puzzle" (how many zeroes the hash must start with) is automatically calculated based on the current hashing power - ie. how many miners are trying to solve the puzzle. The difficulty is calculated so that the average time to mine a block is always around 10 minutes. No matter how many miners are trying to solve it. The value of the block reward going down - so the incentive to mine drops. Some miners will then stop mining - because it's no longer profitable for them (who goes first depends on each miners ability to compete - ie. his cost for electricity and so on compared to competing miners - but someone will quit to do something profitable instead). The combined hashing power of all miners will go down - since there are fewer of them. The difficulty of the puzzle will self-adjust (it will become easier) - making it more likely for each remaining miner to solve a block and get the (smaller) reward. And balance is restored... the miners who continued mining will still be able to turn a profit in spite of a lower reward per block. It will always be profitable for some miners to continue mining - unless of course the value of bitcoin goes all the way to zero. The point is that whatever the total reward for "finding" a block is (block reward and fees combined) - that is how much will be invested in mining it (minus of course a small profit for the miner - but this is likely only a tiny fraction of the actual reward). The important point is that the lower the difficulty is, the lower the security is. If we imagine that value goes all the way down to the point where the total reward for mining a block is for example $1, someone will still be mining - but there will be so few that it will be easy to do a 51% attack: You'd be able to construct an "alternate" history for just $1 per block, so it wouldn't cost much to get the longest chain. There is a recent study by Morgan Stanley, described in this article titled "Bitcoin 'miners' are losing money at any price below $8,600: Morgan Stanley" by CNBC. "We estimate the break-even point for big mining pools should be US$8,600, even if we assume a very low electricity cost (US$0.03 kW/h)," equity analyst Charlie Chan and his team said in a Thursday note. In general, there will not be a catch-all answer for this, as every miner will have different costs for their operation. There are mining-profitability calculator websites out there that may be of interest to you. Also consider that if coin value falls, some miners will become unprofitable and turn off their machines, but many others will still be profitable, and will continue mining. The most efficient miners would likely still be profitable even at extremely low coin prices, once the difficulty has adjusted accordingly. The network self-adjusts to always incentivize miners to mine. In an extreme example, consider a power producing business that routinely generates excess power that they cannot use or store, and so instead it goes to waste. A business like that would effectively have a negative electricity rate, as the power would go to waste if not used.. So even with a very low coin price, at current difficulty they may turn a profit. Has someone compared the cost of mining vs. that of brute-forcing addresses? Will ASIC miners hold the network “hostage” and demand a fee for their services? Will expensive mining equipement have any worth in the future? What is the current actual cost of mining 1BTC? In the case that I have free electricity, is mining worth it? What are the factors that drive the cost of bitcoin mining?